Mine Kaplangi: You are an artist working with paint, as well as with light, sound and digital systems. 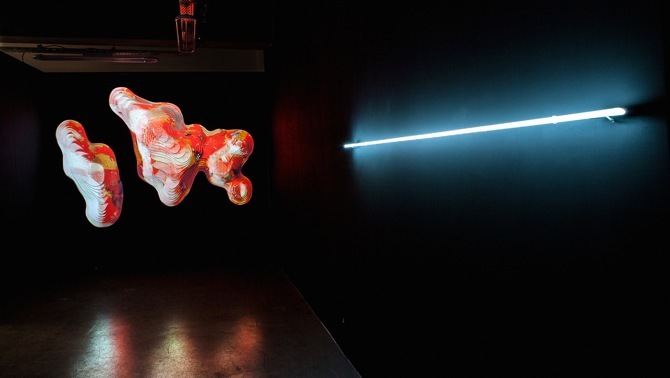 How do you evaluate the significance of new technologies in contemporary art? Candaş Şişman: Digital technologies have created many new opportunities for art as they helped develop works that are based on interactivity and experience. Now the observers are not exclusively observing as they do in classic art; they get to become a part of the process and even change the work itself. Technically speaking, this was primarily allowed by technology. Also, digital technologies have allowed bridging different genres and methods. By increasing the possibility of interlinking different genres these technologies provide us with unlimited combination options. The artist’s role today is to figure out the artistic language in which these elements will be brought together. 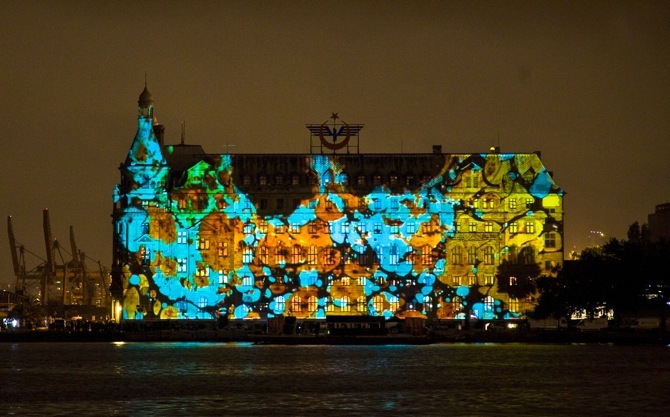 Since digital technologies are advancing rapidly, they also allow art to regenerate itself. Personally, instead of stimulating one sense of the observer I try to address several senses. Depending on the work these senses are sound, touch, sight and smell. To manipulate all of these senses at the same time is very interesting to me. Trying to achieve this, I find classic art to be incompetent and find technology that helps me tie together different techniques to be useful. One of the most important reasons why I use technology in my works is because they allow me to combine different elements in terms of language and method, and also that they allow me to create works that are based on experiencing them. Mine: One of your most recent projects is called “SYN-Phon” – a performance based on graphical notations, which is visually capturing and resourceful. 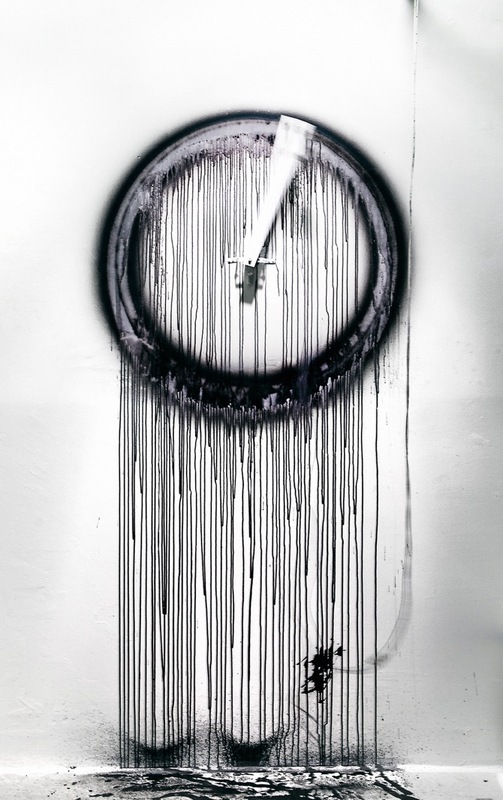 How did you create this mixed-media installation and what does it refer to? 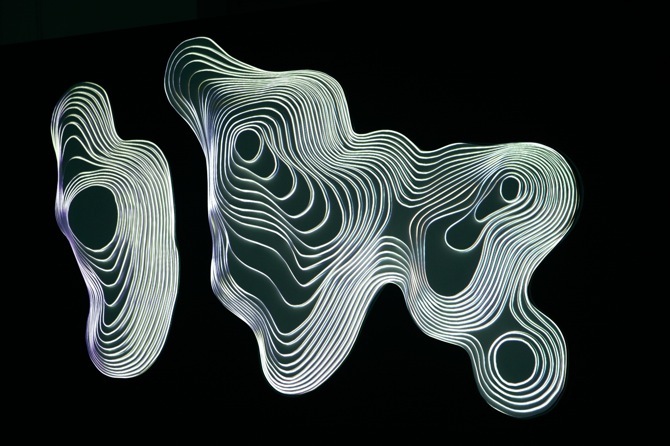 Candaş: SYN-Phon was created during the art residency that I have participated in Budapest Art Factory. 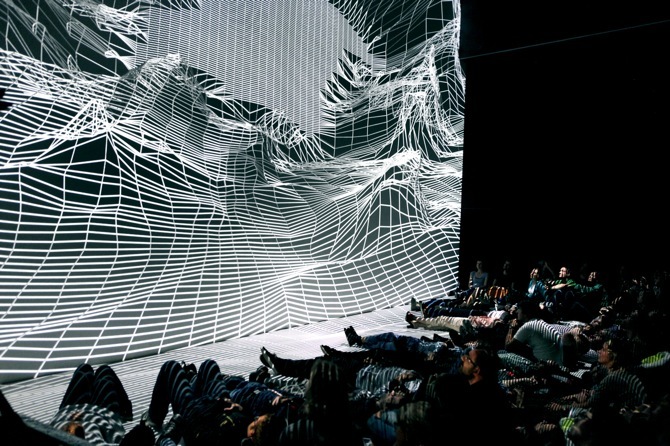 While this was a performance on art, it was also based on visuals. Modern composers of especially the 1950s such as Iannis Xenakis, Conelius Cardew and John Cage have all employed new notation techniques instead of the classic notation technique. The graphic notation technique allowed each of these composers to create their own languages through visuals and geometries. Employing the same technique, I composed a graphic notation which reflected on the month I spent in Budapest. Forming a band by a cello, a trumpet and various electronic sounds we performed this notation. I performed the electronic sounds in that project. 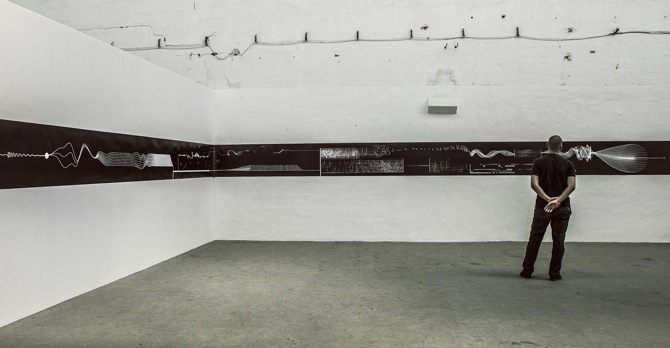 Alongside the sound performance, I printed out a 16-meter long poster of the graphic notation I composed. The observers first viewed the graphic notation in the exhibition and then got to listen to the performance. The conceptual aspect of this project is about language. The languages and terms that we use shape and limit the way in which we think. What kind of a thinking process would we have if we could set aside the language we use and were able to create a language and alphabet for ourselves? I chose graphic notation to tackle this question because the method allows the musicians to be freed of the thinking process that classic notation creates, and it helps direct them to unique thinking pathways. Another conceptual interest I had in the project was to transform two senses as sight and sound into one, just as it happens in synesthesia disease. The shapes I have created when composing the graphic notation were not aimed to establish a visual esthetic but to express the sounds in my mind visually. As a result when composing the graphic notation I tried to imagine two senses as one as such in synesthesia. Accordingly the observers went through a similar experience as they got to watch the graphic notation which enabled to them to follow which shape correlated to which sound. Another reason why graphic notation has such an important musical value is that it erases the strict borders between musician and composer. Since a piece of work crated through graphic notation enables the musician to interact with and shape the composition it allows for the possibility of holistic and variable works to be created. Mine: At the Contemporary Istanbul art fair you presented the piece “Noisefloor”. 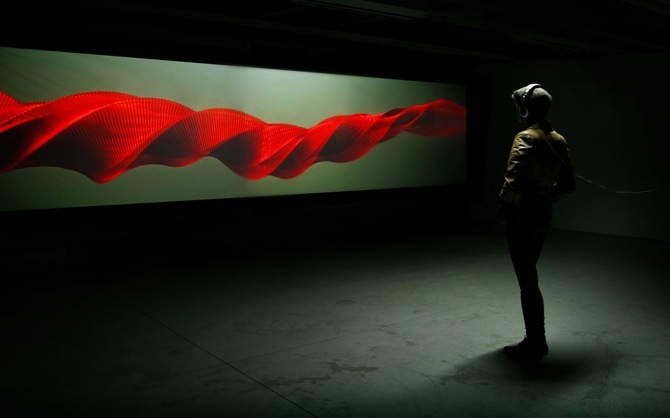 How was the general reaction to this audiovisual installation? 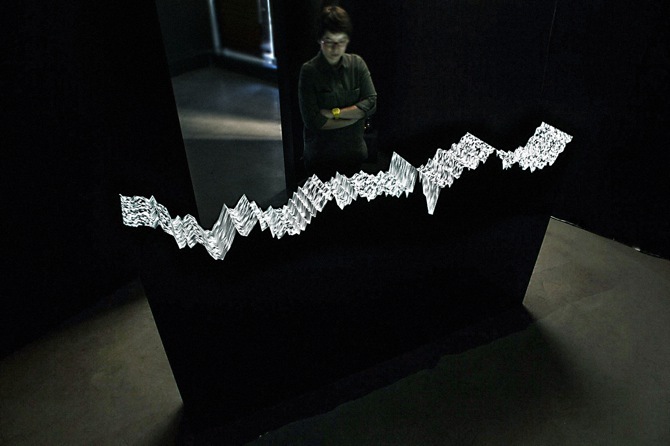 Candaş: NOISEFLOOR is a piece of work that can be called a Data Sculpture. 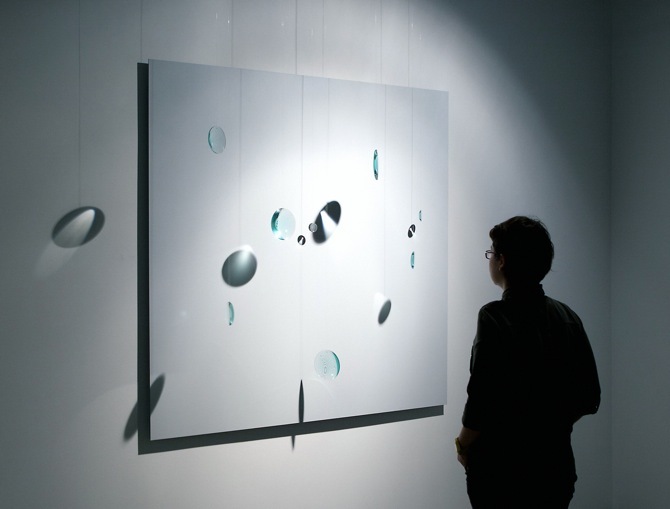 It is an installation piece in which a single recorded sound performed in obsolete silence was focused onto in a digital environment in the scale of 1/10.000, the frequency observed was designed into a three-dimensional form, and the form was used as a base that animation and sound designs were reflected onto. As I wanted to make most basic sounds (such as the earth rotating, the sound of the atmosphere and other sounds of the nature) in silent environments and discrete frequencies visible, the point I tried to make with this work was that silence was unachievable. It is a well-known fact that there are many sounds on this planet that we can’t hear due to our biological structure. For instance, as the earth rotates it creates a very low frequency sound that we are unable to hear. As such the way in which that we can only obtain such little data bares witness to how little we know. Sound and music are very indicating elements for me. I understand sound to be a completely unique way of language and communication. As it is much different than languages that are dictated and thought to us, sound to me is a very natural and pure way of communicating that relates better to the human sentimentality. Since I strive for creating a different language in my works, sound becomes very important in this aspect. Try to establish this correlation I primarily thinks of sound, later to be followed by visuals. If I am working on a piece of moving visuals I create the time scale of the piece to fit the timing of the sounds in my head. To me, sound is a key to distance myself from basic conceptual thinking processes and get familiar with sentimental thinking pathways. Mine: The phenomenon of “Perception” seems to be an important subject for your work. 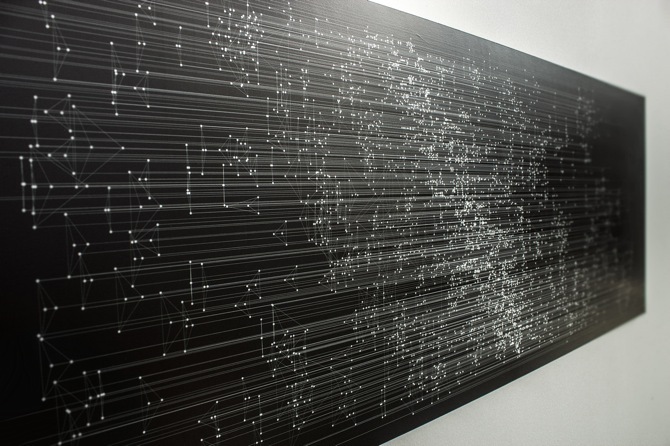 This is striking – for example in the installation " I/P/0-cle". Could you tell me something about this work and its process? Candaş: I/P/O-cle is an installation that I have made for Scientific Investigations exhibition that was curated by Başak Şenova. There are 7 different artists who have participated. As the exhibition took place at Koç University, there were many pieces that are linked to the different disciplines thought by the university. All the artists have created their works by collaborating with scientists and researchers under the university. In my piece I wanted to question the relationship between physics and neuroscience. It’s an installation that conceptually describes the way in which we perceive the reality that exists in the physical world and which layers, variables and cycles are stimulated throughout the process of perceiving, as well as how we distort the reality as an outcome of the process. 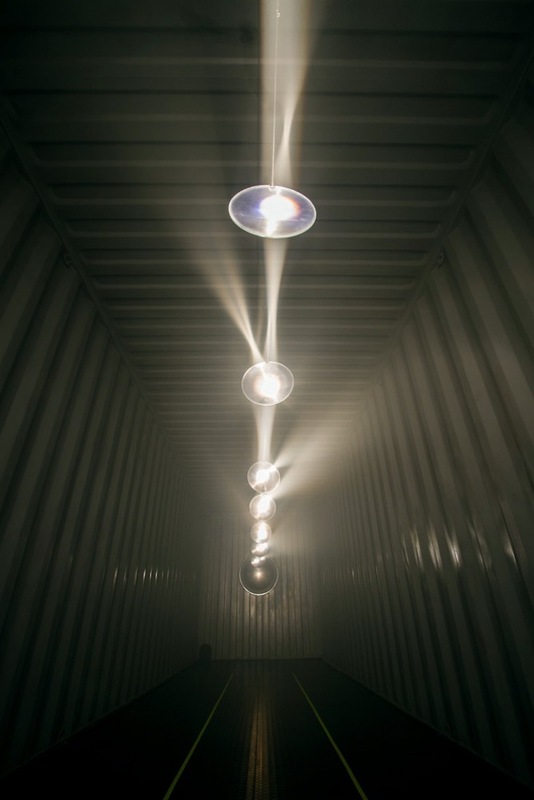 Technically speaking, there is a darkened shipping container with a powerful light source, lenses, a convex mirror, a fog machine and a sound system inside. 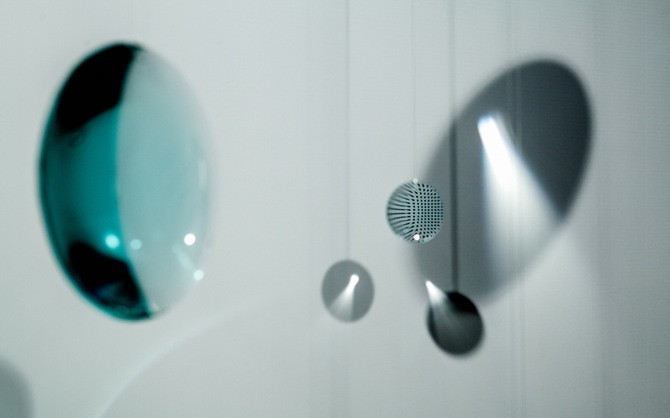 The lenses are placed one after one another between the mirror and light source- increasingly distorting and changing the light that reaches the mirror and the space itself. The mirror deforms, changes and reflects back the visual and the light. 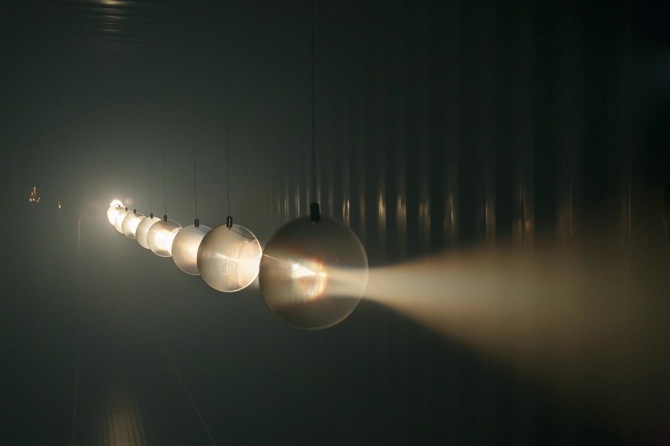 To make the light in the space visible, fog is continuously supplied into the container. A deep bass frequency is also fed into the space. An important aspect of the project for me was to create an experience that stimulated different senses. The fog manipulated the sense of smell and sight, the low frequency bass couldn’t be heard but was perceived by our bodies through vibrations. The usage of the container itself was to create an experience in terms of space. Of course light and lenses were to stimulate our sight. All of these senses combined together created an experience for the observer. The most important thing I can note here in terms of experience is that experience creates knowledge, not the other way around, and this is one of the essential aspects of my work. Mine: Your topics are always very major and philosophical – universal. Why do you work on such general themes? Candaş: I do find creations of humans interesting, but what I find the most interesting is the basic formulations that exist in nature and physics. When you think about it what we create anyway are based on these formulations so it makes them very important to me. I like the relationship between an instance in universe and the behavior of our society. To give an example, when we examine the micro existences based on what we know so far through science, we see that atoms come in circular shapes just like macro existences of planets. These repetitions come together and form a system of hierarchies. Ants live through the same understandings of hierarchies and so do modern humans. The similarities of instances in different scales are very captivating to me. I am not interested in discovering the scientific reasons behind these similarities, I merely observe and try to express them as a whole. I try to pick up on similarities as such and try to express that the chaos that we experience exists through very basic foundations. As I try to capture these basic points that humanity sits upon I try to formalize them and create simulations. In short, what I am interested in are not concepts that humans acquire after birth such as knowledge or worries, but more instinctive and natural instances- and I mean them both on the scale of humans and the universe. They both intrigue me in terms of their basic bits. Mine: What do you think about the contemporary art scene in Istanbul? Candaş: Istanbul logistically and historically is a very important city that enables us to experience East and West at the same time. We would be stronger if we could realize how enriching this is and coexist. Art, from this perspective, is more advanced from this situation but gets to find inspiration from both, which results with gaining the attention of the West. The emergence of qualified establishments alongside innovative people is a good milestone. The quality of the exhibitions that are shown has increased immensely. Personally the founding of Borusan Music House, the beautiful performances they showcase and exhibitions they house such as ‘Matter and Light’ are thrilling. The variety of artistic events has increased which is welcomed by anyone who is understood to be “alternative”. On the other hand we are witnessing the rise of conservatism. While there are many negatives to that, I personally believe that art that isn’t mainstream cannot be created in very comfortable and happy environments, and that it can only emerge from hardship and problematic societal structures. Perhaps this allows us to see Turkey’s position in a better light. Since there are a lot to criticize and ponder on in this country I believe it creates a lot of inspiration for artists. For my work and me however this comes a little differently. I am in search for an understanding and language that is entirely removed from the constructed system and concepts of humanity. The way I live, my observations and my psychological state push me towards such a search. From that perspective, I believe we need to take advantage of Istanbul to the fullest. I don’t think I have to say too much about conservatism. I hope that this is part of evolution and we can dream of a future that will leave behind systems such as religion, money and state with the help of technology and consciousness. Mine: Which artists inspire you? Candaş: There are many artists that I love and follow. Olafur Eliasson, Carsten Nikolai, Anish Kapoor, Ryoichi Kurokawa, Anti Vi, Pe Lang, Tokujin Yoshioka, Tristan Perich, UVA, Antoni Tapies, Ryoji Ikeda, Thomas McIntosh, Ai Weiwei are to name a few. Arvo PART, Aphex Twins, Autechre, Raz Mesinai, Chemirani Trio, Ensemble Modern and Mauricio Kagel are musicians I appreciate. Mine: What is your next project? Candaş: I am working on an audiovisual installation for the Micro Macro exhibition in March in France and I will be holding a personal exhibition in April in Ankara Modern Arts Museum. Our design and animation studio NOHlab is currently working for an audiovisual series for the fashion giant Chanel. We will also be doing a real-time sound visualization performance in the opening of the Scriabin Museum in Moscow with Osman Koç and Bager Akbay.